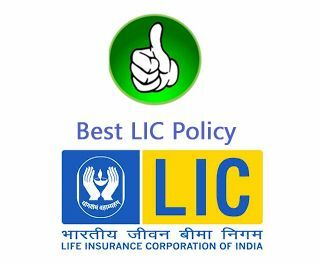 Which one is Best LIC Policy for 2018? Please provide information about Best LIC Policy for 2018. These are common questions which are asked by the readers many times. So, today let’s try to explore the world of LIC Insurance policy and try to get an answer to Best LIC Policy. LIC is most popular and trusted insurance brand in India. The first name comes to mind when we think of insurance is LIC. LIC offers a wide range of insurance policies like whole life, term plan, money back, endowment etc. It is very hard to figure out best LIC policy. If you are looking for best LIC policy here is a readymade help. How to identify Best LIC Policy? In order to find the best policy first, you need to define the purpose of buying an insurance policy. The primary purpose of an Insurance policy is to provide financial protection to surviving dependents after the death of a policyholder. However, few people also purchase insurance policy as an investment product. Their main idea is to get capital appreciation or regular income from the policy. After deciding type of insurance plan you should look at following important aspects. Here are Top 5 Best LIC Policy of 2018-2019 from every category. LIC e-Term plan is pure term plan offered by LIC of India. This plan offers financial protection to the insured family in case of an unfortunate event. It is online policy and no agents are required to purchase this plan. Key features and benefit detail of this plan are given below. The preferential premium rate for non-smoker and female lives. Pure term plan that offers only risk coverage and does not offer any benefit on maturity. Negative point – Premium amount payable in this policy is high compared to other term plans available in the market. LIC New Children’s Money Back Plan is a non-linked, with-profit regular premium payment policy specially designed to meet educational, marriage and other needs of growing children. Moreover, this plan also provides risk cover to the insured child during the policy term. Premium payment will be paid if the death of insured occurs before the commencement of risk. Sum assured + Final additional bonus + Accrued bonus will be paid if death occurs after the commencement of risk. Money back payment 20% of sum assured paid after every 2 years on attaining age of 18 years. Negative point – Maximum expected return on this plan is 5% to 6% which cannot meet the requirement for child education or marriage. LIC New Jeevan Anand is a new version of Jeevan Anand Policy. LIC New Jeevan Anand is a participating & a non-linked endowment plan. The key features and benefit details of this plan are given below. In case of unfortunate demise of the life insured prior completion of the policy term, Sum Assured on Death, vested Simple Reversionary Bonuses, and Final Additional Bonus is payable. On survival of the policyholder till the completion of the policy term, the basic sum assured, vested Simple Reversionary Bonuses and Final Additional Bonus is payable. Additional accidental benefit disable rider can be taken along with this plan. Negative point – Exit from this plan in an initial year is difficult. This plan offers lower returns 4-6%. LIC Jeevan is non-linked whole life insurance product. This plan provides coverage up to 100 years of age. This plan also provides lump sum amount at maturity of term or death of the policyholder during the term. Whole life insurance policy with maximum coverage up to 100 years. 8% of the Sum Assured is paid as money back at the end of the term. Term rider and accidental death disability rider available. Loan facility and coverage of suicide clause. Premium payment will be paid if death of insured occurs before the commencement of risk. An amount equal to 8% of basic sum assured is paid to the policyholder every year till maturity. Sum Assured on Maturity along with vested reversionary bonuses and final additional bonus is paid. Negative point – It is not pure life plan and return from this plan is poor. LIC Jeevan Pragati is non-linked & participating endowment plan. Automatic increase in risk coverage every five years within policy term is plus point about this plan. Key features and benefit details of this plan are given below. Automatic increase in life cover every 5 years. Option of attaching accidental death and disability riders. Loan facility can be availed if premium is paid for three years. In case of unfortunate demise of the life insured prior completion of the policy term, Sum Assured on Death, vested Simple Reversionary Bonuses and Final Additional Bonus is payable. Negative point – Risk coverage at a higher cost. Return from investment is low. Also Read – How Life Insurance Agents are Misselling Insurance Policy? Ideally, you should not mix investment and insurance. Both are different. However, if you are buying LIC policy from an investment perspective it is a big no from my side. Please note that LIC offers only average insurance policies. The only person who admires and promote LIC policies is LIC Agent. The reason is he/she will be earning a lot of commission from the insurance policy. Don’t listen to your LIC agent. Do proper research and study before buying any insurance policy. Note – Please don’t consider above list as a recommendation. Insurance requirement for every individual is different. Make sure to do independent study for finding the best insurance policy. If risk coverage is the only purpose of buying life insurance, I would suggest purchasing online pure term plan from other company. I hope you have got a fair idea about Best LIC Policy in India. If you have any further questions/advise/objection, please do not hesitate to write me here. I would love to learn more about this with you.